Oh I have been craving pizza. Not just any pizza. A real New York slice of pizza with it’s floppy dough base, crunchy crust, terrific tomato sauce, and thick melted mozzarella. There are plenty of pizza places around here but they all have that generic Pizza Hut base and taste. I need a real slice of pizza. Oh man, I would gladly pay someone to Fed Ex a pie from Romeo’s in NJ, if it were possible. 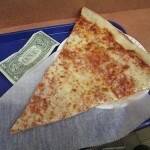 Share the post "I need a slice"